Bad weather is adding to the misery of thousands of migrants blocked at the Greek-Macedonian border. 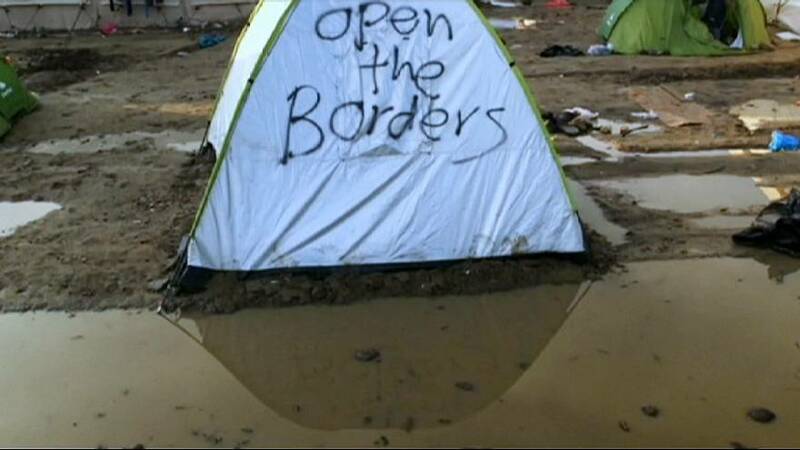 Heavy rain has flooded parts of the makeshift camp where up to 12,000 people have sought refuge. Children and the elderly are among those living in cold and difficult conditions at the Idomeni camp. Syrian migrant Intisar Ali, who is nine-months pregnant, said: “This is full of water, so the people come here, and seven persons, and our bucket is full of water, so it’s so cold. Those affected by the flooding have tried to salvage what they can of their few possessions. Only a handful of migrants are being let through the border every day, causing a long agonising wait for those seeking asylum. The images here are coming to symbolise the migrant crisis in Europe and the failure to find adequate solutions.